Beginning their natural formation approximately 65-140 million years ago, Opals are found in several locations worldwide, with the most valuable and sought after stones originating from Australia. These beautiful stones were formed at a time when Australia was covered by an inland sea. As this water retreated and changes in weather occurred, silica sands dissolved creating a gel that seeped into cracks and crevices in the underlying sedimentary rocks forming the distinctive opal veins we recognise today. The striking colouration of Opal is unique among gemstones as it stems from light diffracting within its internal structure. This light diffraction creates the stunning array of deep blues and greens and vibrant red and orange hues synonymous with this exceptional stone. The most valuable and coveted type of Opal is the Black Opal, with an underlying dark body colour and bright vibrant flash of colours, exclusively mined in Lightning Ridge, Australia. Other types include White or Light Opal which have a distinguishing pale white to grey body colour and Boulder Opal, which can be identified by a layer of solid brown ironstone left on the back of the stone. With such uniqueness within each individual Opal, valuation of these precious gems can be difficult to gauge. Stones with an even and attractive pattern are highly sought after, whilst the red and orange flash colours are rarer and more highly prized and therefore more valuable. Once known as ‘The Stone of Kings’, Opal has long been coveted for its perceived mystical properties and is symbolic of good fortune. In more modern times, this opulent stone has made a resurgence within the realm of high end jewellery. Opals have swiftly become a desirable stone due to their intrinsic uniqueness and timeless appeal and for their owners that exemplify a truly personal treasure. Unparalleled by luxury and opulence, we have recently released our own exquisite piece featuring a rare 25 carat Lightning Ridge black opal. Paying homage to the breathtaking nature of the stone, an opal this magnificent was an exciting opportunity to make something that draws the viewer in from every direction. Each angle of this stone elicits a different emotion through colour, which is highlighted by the ring’s unique and stunning setting. Adorned with custom-cut white diamonds and sapphires, this modern piece is set in black rhodium plated white gold, creating a sense of depth and accentuating the eye-catching aesthetic of the Opal. “Our opal is truly one of a kind. As a designer it was a pleasure to be able to craft a timeless piece and family heirloom that is fit for royalty.” – Matthew Ely. 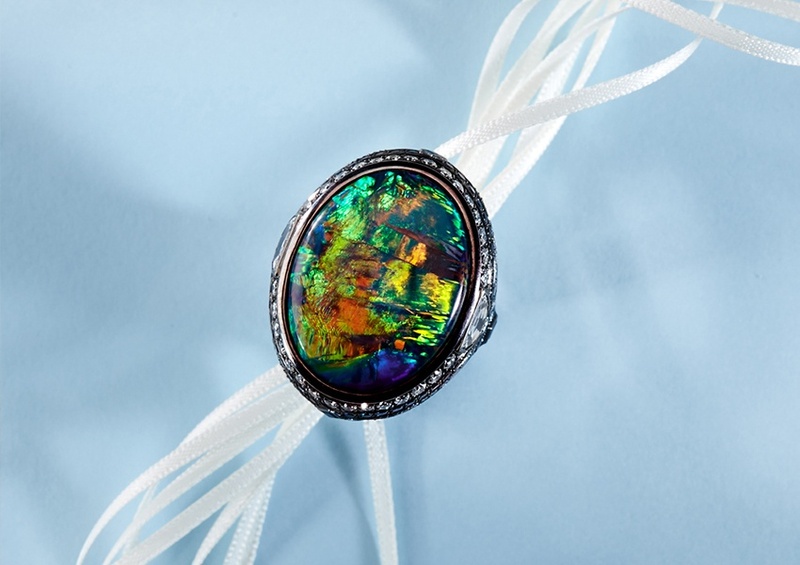 To view our very own breathtaking Black Opal Ring, click here.